Ordinarily a school bus is used by school children from the same school. They tend to get on close to home or at a train station and only get off at their school. 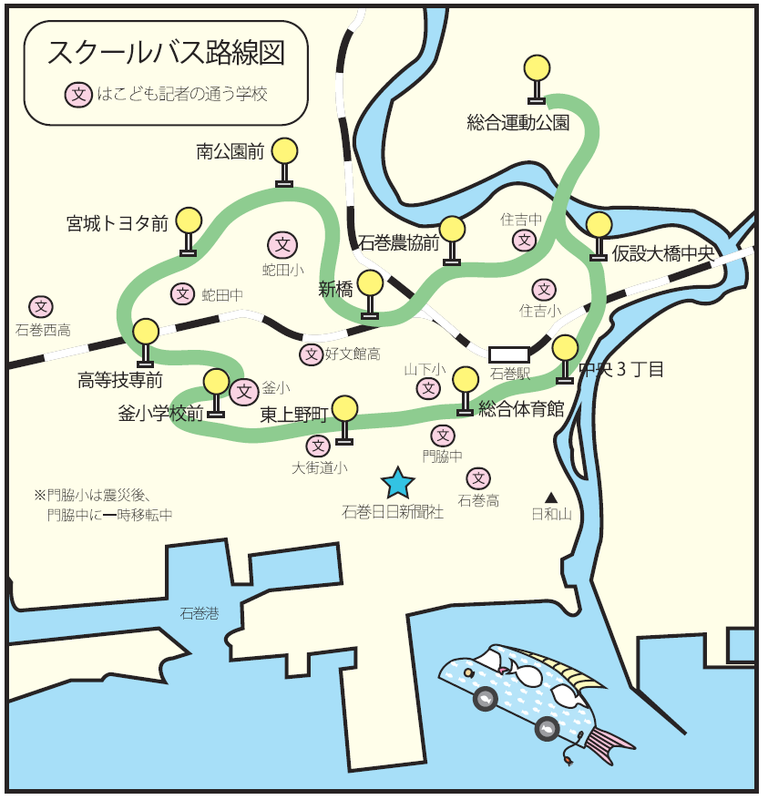 However, this Seibusen school bus, run by Ishinomaki-city, is operated in a different way. School children from different schools use this service, and they board and get off at various bus stops. After the Earthquake, many children were forced to live in temporary accommodation far from their school or outside their catchment areas. 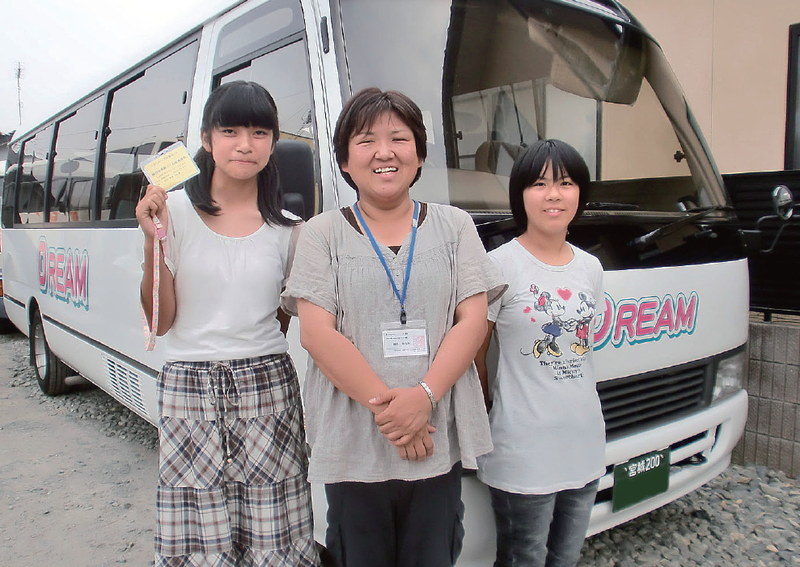 We interviewed one of the bus attendants Mrs. Hiromi Kajiwara. R: How did the school bus project come about? K: After the Earthquake, many children were forced to live in temporary accommodation far from their school or outside their catchment areas. 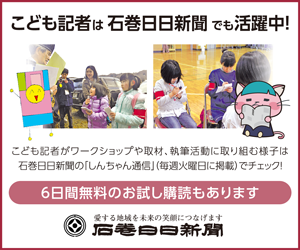 Ishinomaki-city initiated the school bus project in order to help those children travel to their schools safely. R: What area does the school bus cover? K: It takes just over an hour to complete one circuit. The bus runs once in the morning and three times in the afternoon. R: How many bus stops are there? K: There are eleven stops on my route. The number of stops varies from route to route. R: How many children use the school bus each day? K: On average about fifteen to thirty, but it varies from day to day. R: Why did you become a school bus attendant? K: I helped out with the day-to-day operation at an evacuation centre and enjoyed interacting with the people there. That’s why I wanted to become a bus attendant. R: Have you encountered any problems? K: When there’s heavy traffic, I worry about if I can get the children to school on time. R: It must be hard work? K: The first bus leaves at 7:15 in the morning so I have to get up at 5:00. Getting up early is a little hard for me because I can’t stay up late any more. R: About four months have passed, how is it going? K: Back in April, children were nervous, but they have gradually started smiling and speaking to me. To start with, even if I greeted them, some children said nothing for the entire journey apart from the name of their stop. 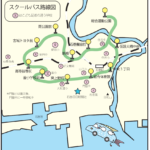 But now they say to me “good morning, Chuo 3-chome please. Today we’re going on a picnic”. It makes me feel very happy indeed.